Mobile makers sure love a cryptic message as Samsung sent out an invite Thursday that tells little yet still manages to say a lot. 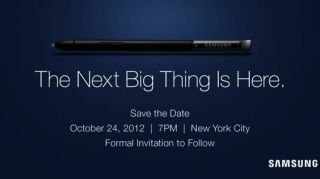 The event is slated for Oct. 24 in New York City, offering not much more than a date, time, and a floating digital pen. "The Next Big Thing Is Here," occupies most of the space, so we can gather Samsung's got a reveal up its sleeves. That product no doubt features a stylus. Naturally, the speculation mill has already started spinning as to what Samsung will show Oct. 24, though the inclusion of a stylus leads to a few conclusions. The South Korean company already showed its 5.5-inch screened Galaxy Note II in August, with a U.S. release coming soon. We've seen the Galaxy Note 10.1 with its 10-inch display, too. So, perhaps Samsung is planning something in the middle, such as a 7-inch variant. The company told TechRadar at IFA 2012 that it's also investing in smaller and cheaper versions of the mobile devices, pointing to the possibility of a budget device making its debut next month. Whatever Samsung shows, TechRadar will be on hand to deliver you the latest news and hands on reviews coming out of NYC.